2 days, 100 speakers, 9 parallel tracks: it’s been a long wait, but finally our Agenda is out! 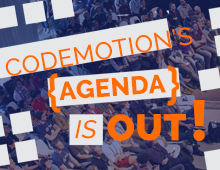 Codemotion Milan 2017 – Special Edition, will bring together the best techie fellows coming from Companies and Tech Communities in a smorgasbord of exciting tech topics and technologies. And remember: Early Bird ticket is expiring! This is definitely the best moment to get your ticket and save!